Some people think it’s dangerous to let newborns mingle with their dogs — especially if they are on the bigger side. However, there is plenty of evidence out there that refutes those claims, including this puppy and baby snuggling up with Mom. 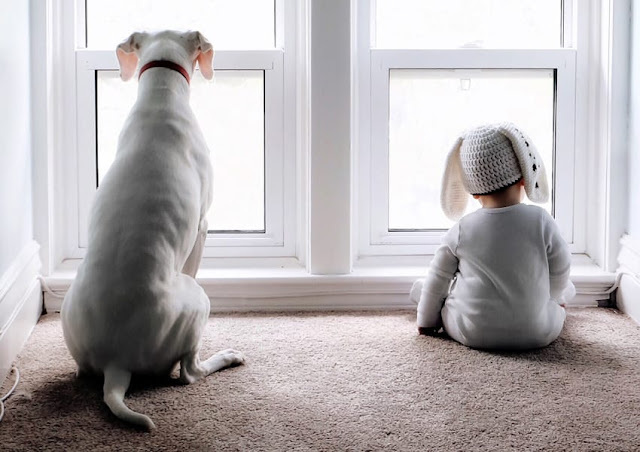 Dogs love having new playmates, especially tiny little babies to befriend. 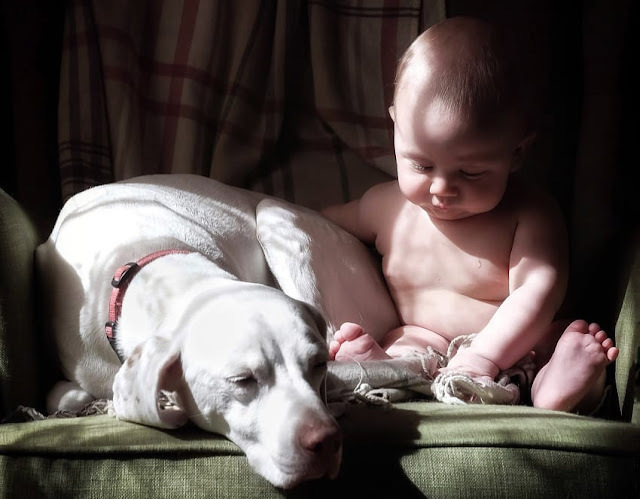 Some pups even get involved in caring for their humans’ babies by doing a little bit of babysitting. This involves nuzzling up to newborns, letting them poke and prod at their fur, and even snuggling next to them during nap time. 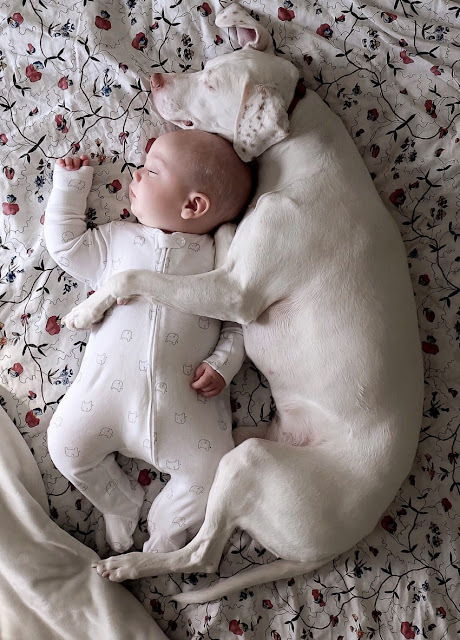 This is what Nora, the rescued English pointer loves to do with little Archie Spence. 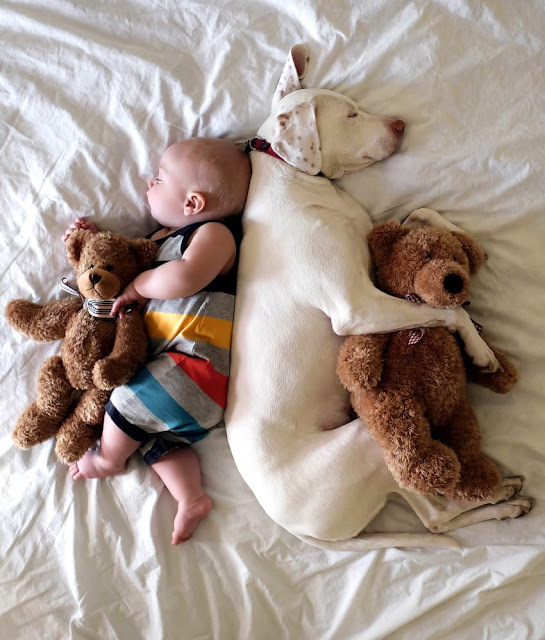 The duo’s many adorable nap times did not go unnoticed by Mom, named Elizabeth Spence, who used the sweet scene as an opportunity to get a little creative with her camera. 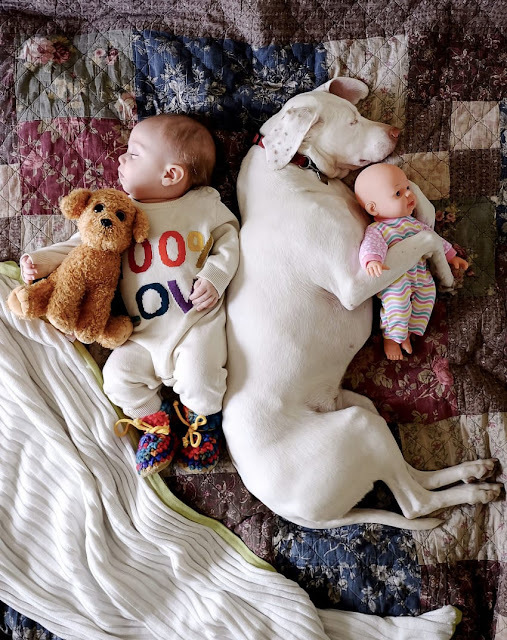 Using a few props, and even some of the other animals in the house, she created a dreamy series of photos that showcase the loving relationship between babies and their pooches. Little Archie Spence is smitten with the family’s English pointer, Nora. Nora is one of three rescue dogs, along with three cats that are part of the family. One of the pair’s favorite pastimes is taking naps together, huddled up with Archie’s teddy bear. Mom Elizabeth Spence was obviously enchanted by the spectacle and snapped the sweet sleepers with her camera. 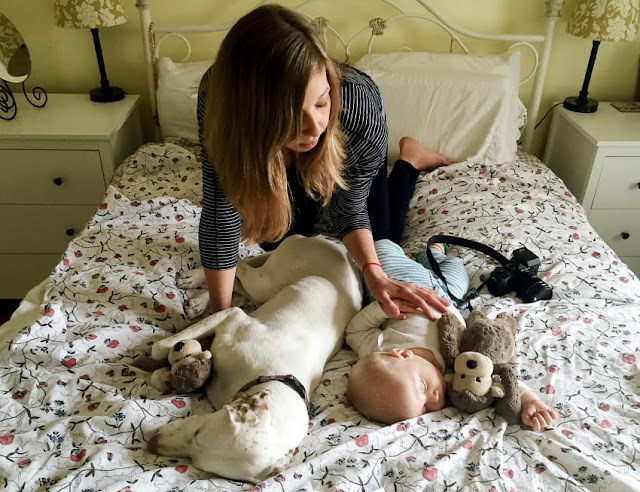 Taking advantage of the baby and dog’s deep slumber, she began to elaborate on the photos using props, dolls, and even other dogs! 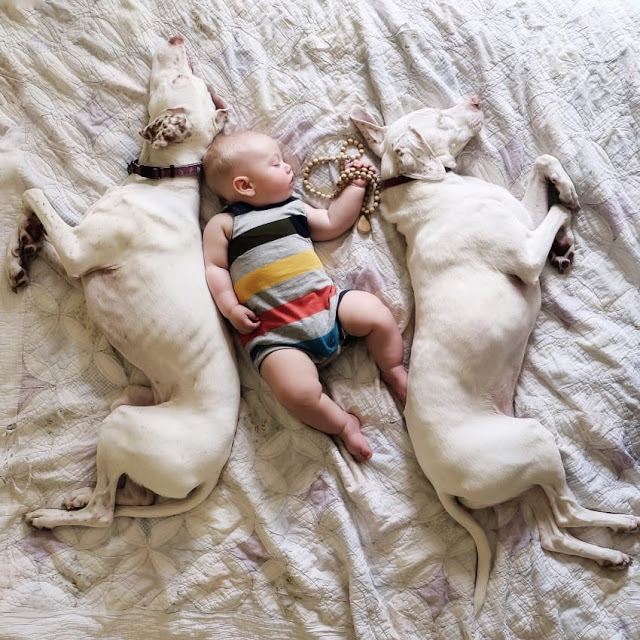 The photographic products are playful, dreamy scenes that show both the pup and the baby snuggling up to toys while deep in dreamland. She even occasionally adds an animal or two into the mix since there is no shortage in the house! Spence specifies that the photos are easy to prep given that there is always an animal on hand that wants a little love. She snapped the photos to show off the adorable pair, but she also hoped to show off the amazing nature of rescue animals like Nora. She has also assured inquirers that Archie always sleeps next to the dog under her supervision. 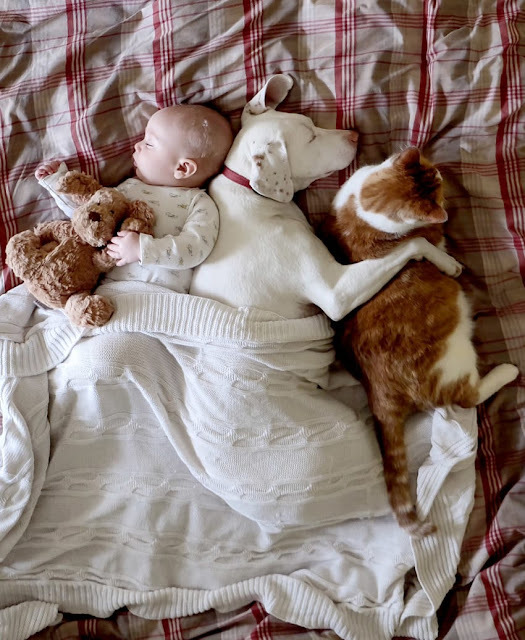 Sometimes, the whole gang gets in on nap time and happily snuggles next to the baby while catching a furry snooze. 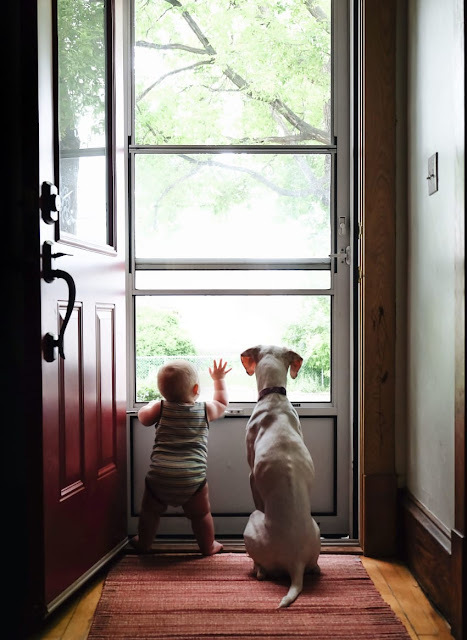 The sweet shots definitely satisfy Spence’s intentions of showing how sweet dogs — even rescues — can be around babies. We have a feeling that Archie and Nora have many more cuddly and photogenic moments to look forward to in the future.